Wow, has it really only been a year since Far Cry 5? 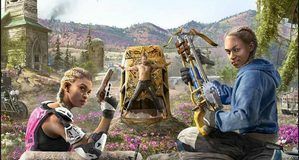 The game that was supposed to revamp the Far Cry series came and was kind of fun, but not quite as satisfying as we hoped for. 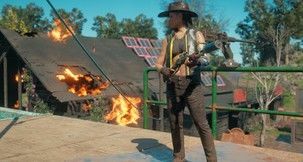 Now, with presumably less development time, and the same map, we’ve got a post-apocalyptic sequel in Far Cry New Dawn, which may or may not be an expansion kinda. 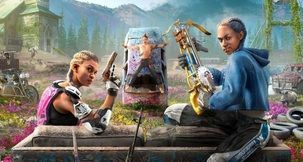 Far Cry New Dawn is set roughly 17 years after the cataclysmic ending of Far Cry 5, and is for the first time since Far Cry Instincts: Evolution, a direct sequel to the previous game. 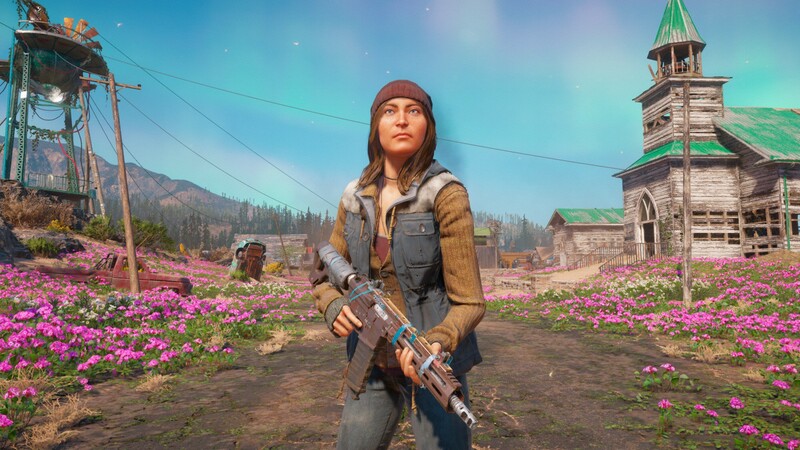 After the devastation, and unlike most post-apocalyptic games (see: every single FPS coming this year), Hope County has mostly been reclaimed by colourful nature rather than sand and rock. Unfortunately, the residents of the new world are plagued by a vicious gang called the Highwaymen, so it’s up you (as one of the last remaining lawmen) to hit back… even if it means calling in the help of the New Eden group. 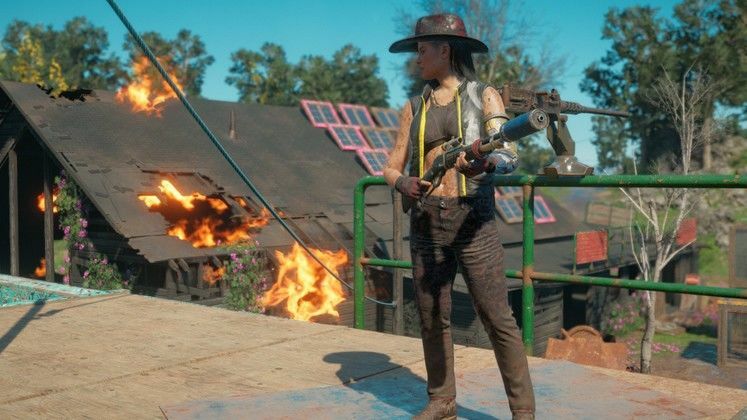 The story’s nonsense, frankly, and much like FC5 is full of Cutscene Incompetence Syndrome (where the player character suddenly becomes useless for narrative purposes) - there was literally a moment where I was screaming “JUST PULL OUT THE ROCKET LAUNCHER AND SHOOT THEM” at the screen. 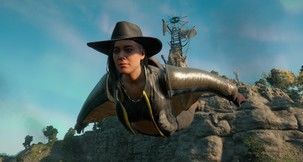 Fortunately people don’t play Far Cry games for the story, but I do like that Ubisoft have made the New Eden group more interesting and less insane this time around. At the very least, the Highwaymen make for far more interesting villains. The Twins, Mickey and Lou, don’t have much backstory but are nicely unreasonably evil (and honestly it’s nice just to have some female villains for a change). 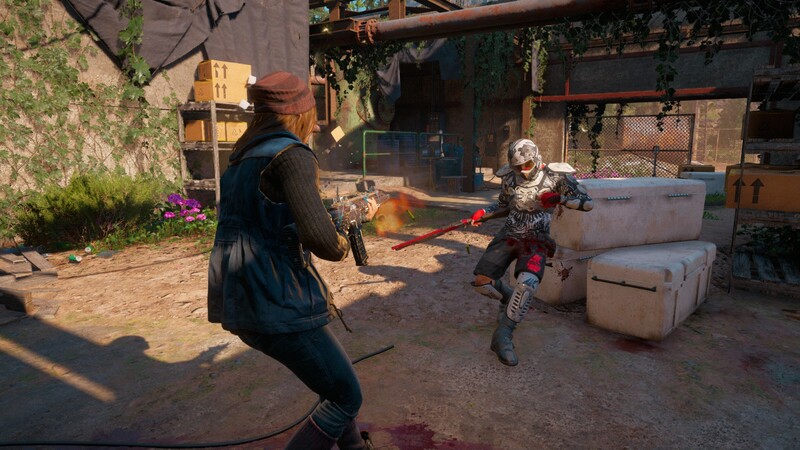 The individual enemies, though, are just far more satisfying to fight, with different tiers of soldier with different weapons and armour types. It helps that they look a lot like Blood Dragon’s b-movie rejects, too. Bit of Mad Max and Rage in there as well. They’re just generally more entertaining enemies than the Peggies, who all looked and acted much the same, and that goes a long way to making Far Cry New Dawn more fun to play. 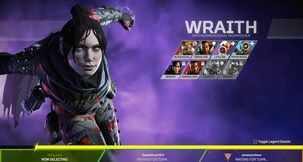 It does have to be pointed out that this is a bit of a cut-down experience, probably somewhere between Blood Dragon and Primal in terms of content. The map’s a slightly cut down version of the one in Far Cry 5 (don’t expect to go back to the haunted hotel, for example), and while a lot of things have changed it’s essentially the same layout. 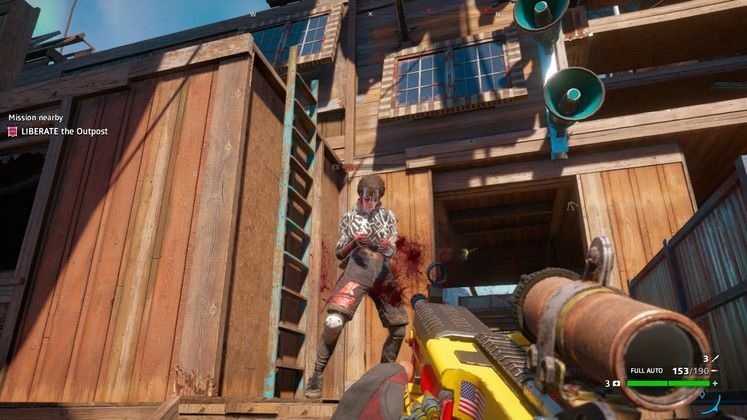 It’s also a little shorter than Far Cry 5, although remember it’s also a little cheaper too. 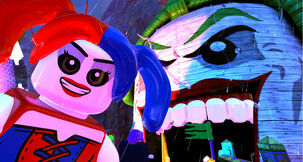 Importantly though… it’s kinda more fun. 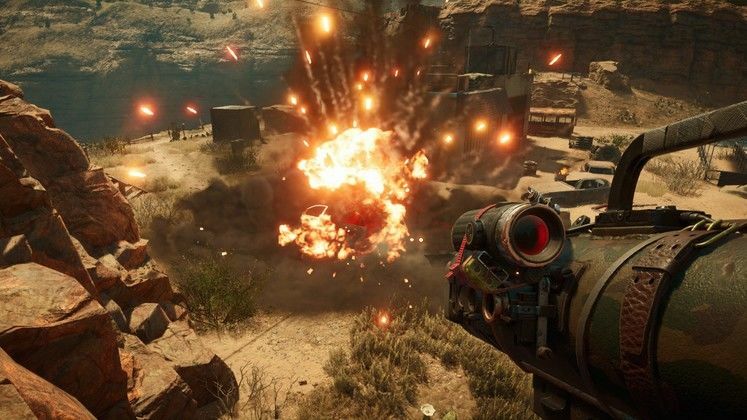 Far Cry 5 never had satisfying enemies, or a particularly interesting world to explore. I’ve mentioned New Dawn’s crazy colourful Highwaymen, but despite being smaller than the last game the actual world is more fun. You don’t have death raining down on you every five feet, to the point where it feels like a hindrance rather than fun, for a start. Everywhere is more colourful, locations are all Mad Max-ed up, and it feels like a world you actually want to spend time in. And shoot things in. The weapons and vehicles are all colourful and fun too, even if the Tier 1 weapons are utterly awful. You’ll want to get rid of them fast. The first bow you get, for example, has the stopping force of a small hedgehog. And despite its ‘cut-down’ size, there’s a decent amount of content here. There are multiple expertly-designed Outposts that can be increased in challenge and are always entertaining, although they never reach the fortresses of Far Cry 4 (and it’s admittedly disappointing they don’t get taken over unless you let them). Expeditions are neat little side-missions too, taking you outside the confines of the map. 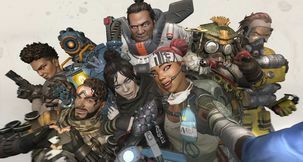 While you probably won’t get lost in New Dawn, or have it installed on your PC for months (15-20 hours is probably the maximum) there still more than enough to have fun with. And we did have fun. 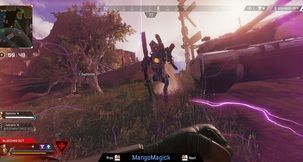 Our system is an AMD FX-8300 Six-Core Processor, 16 Gb RAM, Nvidia GTX 1050 Ti 4Gb, and Windows 10 64-Bit, and it ran Far Cry New Dawn fine with all the trimmings on. 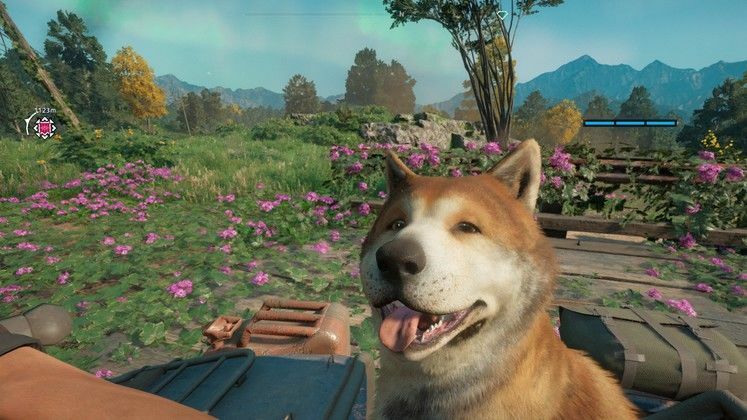 It’s not a spectacular-looking game as it’s still very much based on classic Far Cry tech, but it’s still nice to look at - more so than Far Cry 5, just because it uses colour a lot more effectively. It’s a good-looking game, for sure.